6. What do the Jewish bride and groom wear? We reposted this from SewJewish.com – to subscribe for the 18% discount on the book, sign up for the newsletter at SewJewish.com. We’re still officially in draft mode, so the first person to spot any spelling mistake on this new cover for the Sew Jewish book gets a free copy. But we think we have a final version here, and we’re kind of excited. 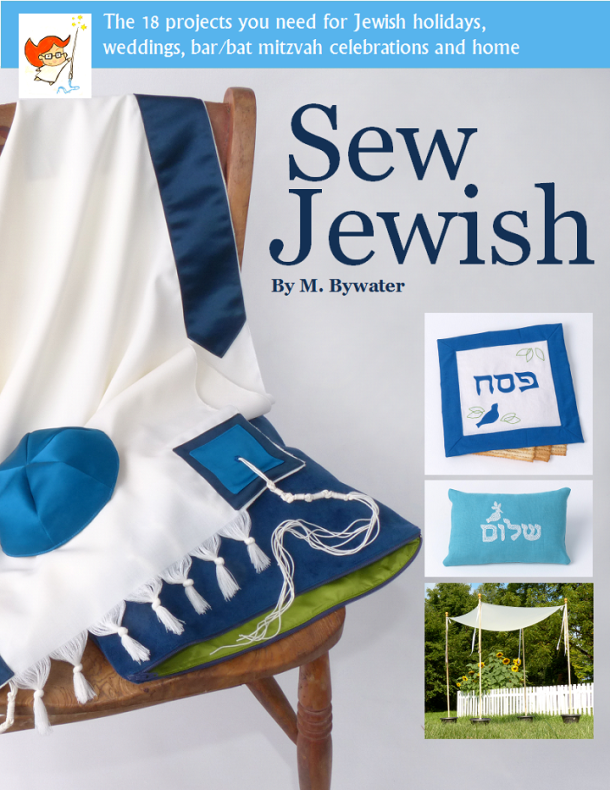 The design shows off six of the 18 projects in the book: a kippah (yarmulke), tallit with tallit bag, a matzah cover for Passover, a sweet little decorative Shalom pillow, and a wedding chuppah. The Sew Jewish book comes out in digital form in October at Amazon.com (Kindle) and the SewJewishShop.com (PDF). The blockbuster movie can’t be too far behind. The subtitle sums it up: The 18 Projects You Need for Jewish Holidays, Weddings, Bar/Bat Mitzvah Celebrations, and Home. We’re working on a video to show you how to make DIY huppah pole stands — in connection with our sister site, SewJewish.com, and commercial sculptor Bill Bywater. 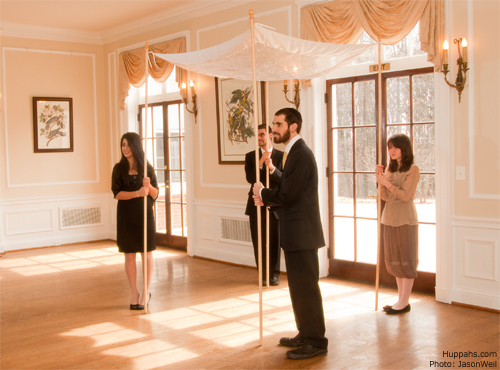 We get lots of email requests for advice on making stands for huppah poles, and these are a version of the style we’ve used with local huppah rentals at Huppahs.com. We’re working to get the video up next week, but here’s an outtake. If you’d like to get an email when we post the video, we invite you to subscribe to the blog (there’s a sign-up box near the top of the column at the right). Restaurants are great integrated service providers — a location, food, beverages, staff, and decor all in one nice package. And the great thing about restaurants is that people eat in them all the time. Of course the restaurant wants to pluck your wallet for as much cash as possible. But they’d also like you to come back for dinner. And they’d like your friends to come back for dinner. Compared to most weddings, it’s a much more natural, normal business arrangement in which the incentives are aligned correctly. Money is made by providing good service at a reasonable cost. And the great thing about restaurants is that they exist at all kinds of different price points. Set your budget. Find a place you like that fits it. Once you cut ribbon, the threads at the end can fray and look messy. Packing up the ribbon to get it to your wedding venue and tying the ribbon to your huppah can make the fraying worse. That’s not a fun look for your wedding. 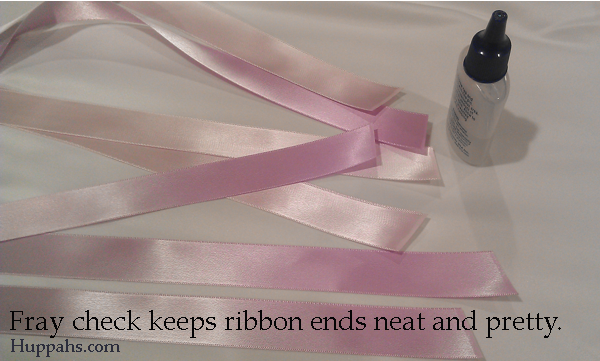 But you can prevent stray threads and keep your ribbons looking neat by sealing the ends with liquid fray check, which you can find it at fabric and craft stores. After cutting the end of the ribbon neatly, apply fray check and let it dry. After it’s dry, trim the ribbon again to leave a strip of fray check that is no more than about 1/8″ (3mm) wide. More tips for decorating your huppah with ribbons here. Who Stands Under the Huppah? 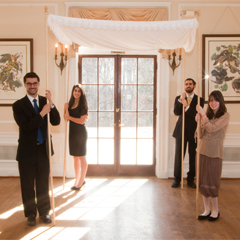 The question of who stands under the wedding huppah is one of the more popular email questions we get at Huppahs.com. The answer is a matter of custom rather than Jewish law or strong tradition. Generally, the couple getting married and the officiant stand under the huppah. Parents and members of the wedding party stand to the sides. The inclusion of the officiant under the huppah is a relatively new development. If you look at etchings of early huppah ceremonies from the Middle Ages, when huppahs as canopies first became part of the Jewish wedding ceremony, only the bride and groom stood under the huppah. This is consistent with the idea of the huppah representing the couple’s home and shared spiritual space. Because we’re talking wedding custom rather than law, there is room for exceptions. At the wedding of ultra-orthodox royalty earlier this year, dozens of people stood under the huppah. But that huppah was probably at least 25 feet wide on each side. And they had 25,000 guests. Well, this is big news! 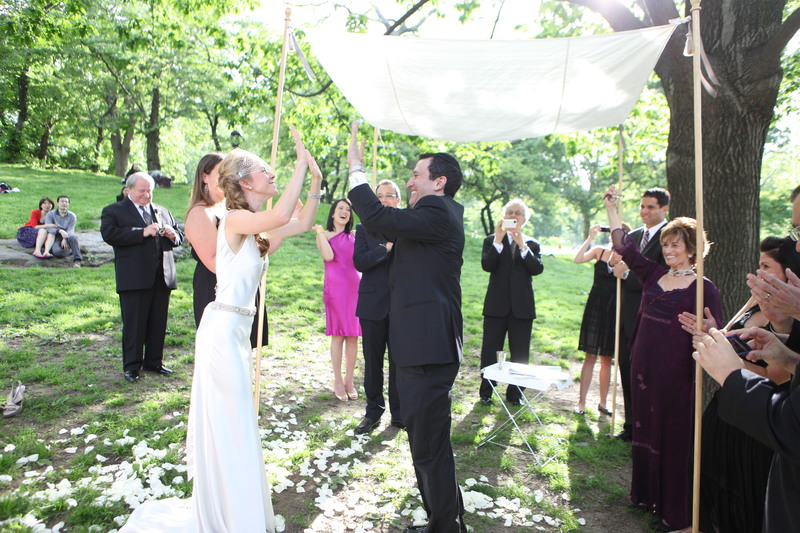 Huppahs.com now makes two of its popular wedding huppah canopies available to rent without poles. Perfect if you already have poles and are looking for a beautiful, high-quality canopy. The Simplicity Canopy, pictured above, is fashioned from a high-quality bridal satin. The fabric’s subtle sheen and substantial hand create a simply elegant canopy that works wonderfully in any wedding venue. The Ivory Silk Canopy, shown in detail at the right, has the refined texture characteristic of 100% dupioni silk. The light ivory color cultivates a warm sophistication. Get more details and find out if these canopies are available for your wedding date at Huppahs.com. Non-Jewish couples who use huppahs for their weddings are part of a growing trend, says Ted Merwin in the New York Jewish Week. It makes sense. With so many couples getting married in non-traditional spaces like parks, museums, and bistros, a huppah is a way to make a ceremony space feel special and look pretty. The Jewish royal wedding of the season took place in Jerusalem on Tuesday night, when Shalom Rokeach, 18-year-old grandson of the leader of the Hasidic Belz Rebbe dynasty, married 19-year-old Hannah Batya Penet in an ultra-Orthodox ceremony. While the groom is Hasidic royalty, the bride is a commoner, inviting parallels to Wills and Kate. A huppah befitting a royal wedding: It looks like its about 25-feet square. The canopy is blue — looks like velvet — with scalloped valances that are embroidered in gold and edged in heavy gold bullion fringe and gold tassels. Chandeliers — 5 of them — hung under the huppah. The bride’s full ball gown without a train – formal, but nothing to trip on when circling the groom. The bride’s ceremony veil. It’s heavier than most, for the sake of modesty before all those male guests, but the bride wears it well, and the length is great. I still don’t know what they served at the reception, which was my first question after finding out about the 25,000 guests. If you find out, let me know. Here’s another video, where we get to see a little more of the bride in action. She circles the groom at the 2:00 minute mark. Want a quick overview of the smoking trends for Jewish weddings in 2013? Mazelmoments just released their 2013 Wedding Trends Report. The folks at Mazelmoments filled the report with colorful, informative snapshots of what we’ll be seeing a lot of at Jewish weddings this year, including decor, catering, ketubahs, and huppahs (Spoiler alert: just like Huppahs.com, Mazelmoments finds that couples are having a love affair with organza huppahs). To get the report you’ll need to sign up for Mazelmoments’ newsletter, but if you’re planning a wedding or if you’re a wedding vendor, their mailing list is a good place to be. Sign up and get the report. Are you loving a trend that you’re seeing? Shout it out in the Comments section. 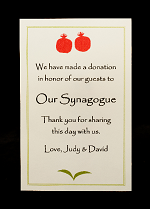 Royal Wedding Hors d’Oeurve Reception Menu – Kosher-fied! The Jewish wedding ceremony is richly layered in centuries of tradition, Jewish law, spiritual teachings, and customs from communities around the world. Here we’ve laid out the basic structure of the traditional Jewish wedding, with some of the most widely-accepted interpretations of the parts of the ceremony. We’ve also included some of the most popular customs and practices that couples have added during the past few decades. If we’ve missed any of your favorite customs or interpretations, feel free to add them in the Comment section. Traditionally, Jewish wedding celebrations begin with separate receptions for the bride and groom, together called kabalat panim. Many contemporary couples combine the activities of these receptions into one small pre-huppah ceremony attended by only a few family members and friends. Attending the Bride. At the bride’s reception, referred to in Hebrew as hakhnassat kallah, the bride sits on a specially decorated chair and receives well wishes from her guests. The Groom’s Table. At the groom’s reception, or chossen’s tish, two traditional documents and one newly-adopted document are signed. The Tenaim. The traditional formal agreement between the two families that the bride and groom will marry. The Ketubah. This is the wedding contract. In the most traditional of Jewish weddings, the purpose of the ketubah is for the groom to assume his legal and moral obligations to his wife. The groom and two witnesses sign it. Increasingly, couples choose ketubahs that lay out both partners’ obligations to each other, and both partners sign them. Prenuptial Agreement. The Prenup is a new agreement, introduced in the 1950s and embraced by a wide spectrum of Jewish communities. It helps ensure that a woman who marries under Jewish law and decides in the future to end the marriage will be able to obtain a divorce under Jewish law. The Conservative movement incorporates this agreement into its standard ketubah through what is called the Lieberman Clause. Modern Orthodox communities generally use a separate prenup form. Veiling the Bride. Also called bedecken. The groom lowers the veil over the bride’s face. The groom is the person who lowers the veil so that he can make sure that the bride is the person he intends to marry. The practice recalls the Biblical story of Jacob, who was tricked by his father-in-law into marrying the sister of his intended bride. In a traditional Jewish wedding, the groom puts on a kittel, a white robe, before the festivities move to the huppah. Wearing white, for both the groom and the bride, signifies that for them this day is a new spiritual beginning. The kittel has no pockets, symbolizing that the bride marries the groom for who he is rather than for what he owns. For the same reason, the bride removes her jewelry before the huppah ceremony. The wedding takes place under a huppah, a canopy that represents the couple’s physical and spiritual home. The huppah is open on all four sides, like the tent of the first Jewish couple, Abraham and Sarah, to associate the couple’s home with the hospitality for which Abraham and Sarah were known. Historically, a bride was escorted from her home to the ceremony while walking under a huppah carried by four huppah-bearers. The Procession. 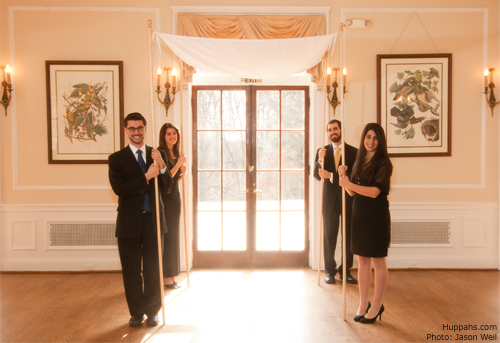 For a ceremony using a traditional hand-held huppah, the huppah bearers carry the huppah into the ceremony space. Then, as with other modern wedding processions, any special honored guests are escorted to their seats, and the members of the wedding party enter and take their places. The groom is escorted to the huppah by his parents, and the bride is escorted by her parents. Kiddushin, The Betrothal. When the bride reaches the huppah, she circles the groom seven times, creating the spiritual space that will surround them in marriage. The number of circles can vary. Today, both partners may take turns circling each other to symbolize their mutual obligations to each other. After circling, a bride stands to her groom’s right. Blessing for the First Cup. The rabbi recites a blessing over a cup of wine, and the wedding couple each take a sip. Some couples may pass the cup to their parents or other guests for them to sip. The Ring Ceremony. This is the central act of the Jewish wedding ceremony. The groom places the ring on the bride’s right index finger while reciting the following, in Hebrew or his native language: “By this ring you are consecrated to me in accordance with the laws of Moses and Israel.” Today, some brides also give the groom a ring at this time, while reciting a similar statement to that of the groom. Bride’s Acceptance. Two people must witness that the bride accepts the ring willingly. 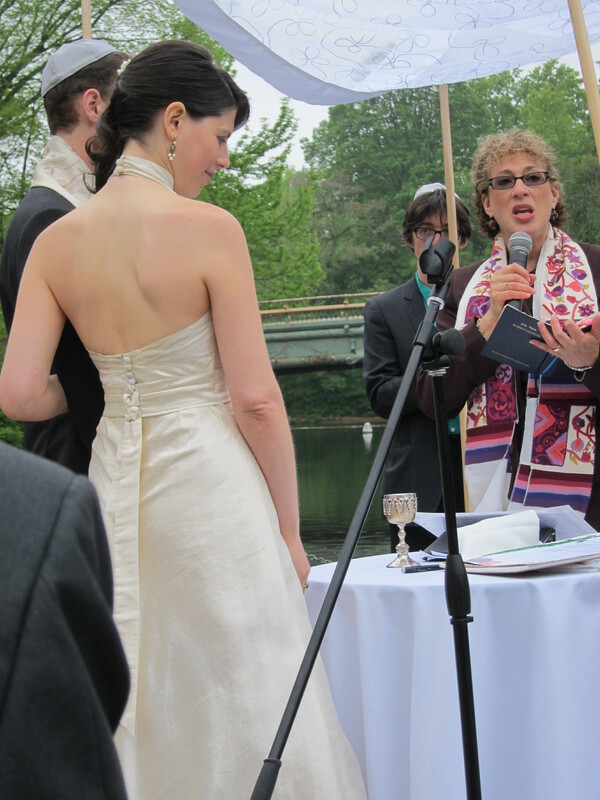 Reading the ketubah is not a formal part of the ceremony, but today most couples incorporate it into the ceremony at this point. The sheva b’rachot, seven blessings, are recited. These prayers place the couple within God’s continuing act of creation and celebrate the many voices of joy that God created in the world, including the voices of the bride and groom. The newly married couple spends some time in seclusion — at least eight minutes according to strict interpretations of tradition — breaking their wedding-day fast and sharing their first married moments alone together. The bride puts on the jewelry she took off before the huppah ceremony. For modern couples who do not have a double ring ceremony under the huppah, this is a good time for the bride to present the groom with his wedding ring. After the yichud, it’s time to join everyone else at the party! This is the season when engaged couples start looking in earnest for — and media start posting and publishing — wedding planning checklists. Each year I’m surprised at the number of Jewish wedding planning checklists that leave out a critical item: the huppah. I suppose it’s a bit self-serving of me to mention this, since my company rents huppahs, but I guess I’m hoping to get this item included in as many guides as possible or get it hand-written onto as many couples’ lists as possible to help ensure that the huppah is a source of joy for couples rather than a last-minute worry. Last-minute huppah rentals are something of a specialty of Huppahs.com. In fact, we love being able to tell panicked clients who contact us just a few weeks before the wedding that they will have a huppah, delivered to their door, no problem. But every once in a while we have to say that we no longer have anything available, which is heartbreaking for couples and for us. We also work with clients who reserve their huppahs more than a year before their weddings. The nice thing about working with brides and grooms as far in advance of the wedding date as possible, for them and for us, is that we can give them as wide a range of huppah styles to choose as we can. The check box for reserving a huppah should ideally lie just under the check box for choosing the ceremony location. When you know where your ceremony will be — whether it’s a synagogue, beach, country inn, hotel, backyard, bistro, or zoo — you have a good idea of the style of your wedding and the style of huppah that you would most prefer. So we recommend that couples contact us to check huppah rental availability soon after they choose the location for their ceremony. That’s when you’ll have the widest selection and the best chance of securing the huppah that works best for you. And we do try to make your huppah rental the easiest box to check off your to-do list. How can we make huppah rentals even easier for you? Leave us a note in the Comments section. We love all the positive reviews we get for Huppahs.com, and one of my favorites said we “make it as easy as Zappos.com to receive and return your chuppah.” Zappos is a company that we thought of as we designed our services. We try to make it as easy to rent and return a wedding huppah as it is to buy and return shoes for Zappos. We ship the huppah by FedEx to arrive by the Wednesday before the wedding so you can be confident you’ll have it when you need it. We provide simple instructions for attaching the huppah canopy to the poles. It takes about three minutes. When it’s time to return the huppah, use the box the huppah arrives in and the pre-paid FedEx return shipping label we send. You can drop it off at a FedEx location or call for FedEx to pick it up, which ever is easier for you. Is there a way we could make huppah rentals even more convenient for you? Send us an email. 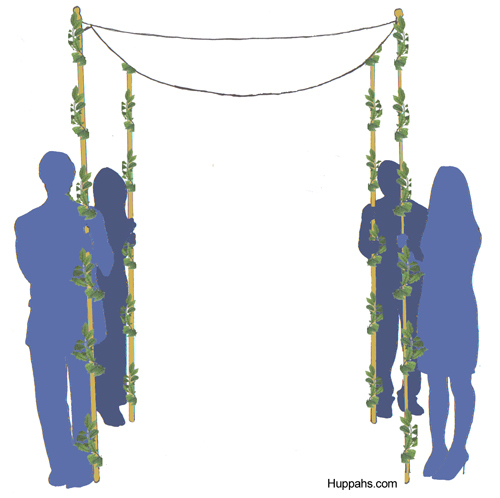 Reader Question: How Do I Attach 2 Tallits Together to Make a Wedding Huppah? Question: We are thinking of making a huppah canopy by combining the groom’s father’s tallit and his grandfather’s tallit. Do you have any recommendations for how we might do this? 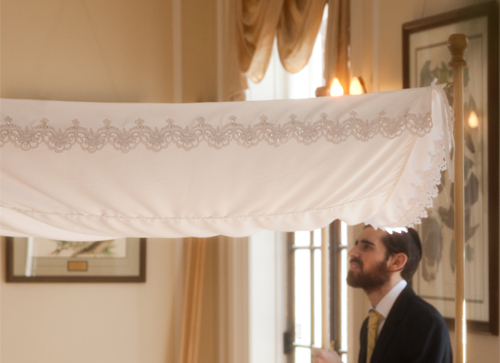 Answer: The idea of making a wedding huppah canopy from more than one tallit, or prayer shawl, is a definite trend. At Huppahs.com we’re getting variations on this question more and more often. 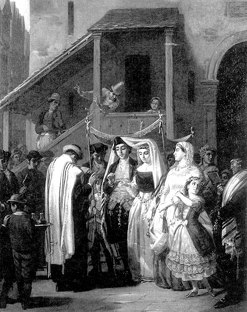 Jewish couples have been marrying under huppah canopies made from tallits for centuries (Quick point: The Hebrew language plural for “tallit”, also spelled “tallith” would be “tallithim ” or “tallisim”. However, I’m using tallit as an English language word, so I’m using the plural “tallits”). Through the ages, the bride and groom stood under the groom’s tallit, in keeping with the symbolism of the huppah as the couple’s physical home and their shared spiritual space. Many of our clients use our huppah poles with their own tallits or a tallit of a family member to create a very personal huppah. Today, the idea of combining the tallits of more than one person is seen as a way to honor people who are special to the bride and groom and to represent the presence of these people in the couples’ lives. Compatible Lengths: Make sure the two tallits you want to attach together are the same length. Final Canopy Size: Every fabric canopy will drape in the middle. The larger the canopy, the more the drape. You’ll want to make sure that the size of the combined tallits isn’t so large that it drapes too low in the middle. Also, the larger the canopy, the more it will weigh, and heavier canopies pull more on the huppah poles. Be sure to use poles that are strong enough to handle the weight of the combined tallits without bending. For Huppahs.com’s poles, we recommend a canopy size that is no larger than 60″x80″ (1.5mx2m). That size yields a nice drape, and the poles are easy to hold. Tallit Age: If you are using an older tallit, such as a grandfather’s tallit, look it over carefully to make sure the fabric isn’t frail or threadbare. Stitching two prayer shawls together will make small holes in the tallits, and when the canopy hangs the huppah poles, the weight of the tallits will pull at the fabric along the seam. Make sure the tallits are strong enough to hold up well to this kind of treatment. Religious Nature of a Tallit: Keep in mind the religious role of the tallit. Wearing a tallit for prayer isn’t just a tradition, it’s a practice rooted in religious obligations laid out in the Torah. The Biblical and spiritual power of the tallit lies in its shape, with four corners, and the ritually knotted strings on the corners. Sewing two prayer shawls together changes this physical structure. It reduces the tallit to a symbol, rather than a garment that, when worn with the intention to fulfill a religious commandment, can raise prayer to a higher level of spirituality. And although sewing tallits together can create a huppah canopy with great emotional meaning, my recommendation as a huppah and tallit designer is to use only one tallit for your huppah, to ensure you are preserving the tallit’s religious and spiritual power. Ask them to hold a huppah pole. Ask them to recite one of the seven blessings during the ceremony. 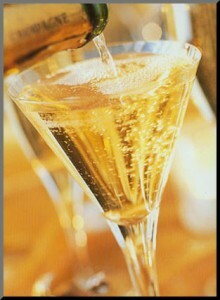 Acknowledge them during a speech or toast at the reception. Update: Here’s another option for using two tallits that doesn’t involve sewing them together: Attach one tallit to the huppah poles, and lay the second tallit on top of the first. You would want to make sure that the fabric of the first tallit is strong enough so that it won’t rip at the point of the tallit where you tie it to the poles, especially since the fabric will be carrying the weight of two tallits. This would be a way to combine two tallits without sewing them, and it would be a way to include a second tallit that is older and frail or too delicate to sew or carry weight. This idea comes from a Huppahs.com client who wanted to use a grandfather’s tallit that was too frail to be tied to the poles. His solution was to start with a Simplicity Huppah and lay his grandfather’s tallit on top of it. A great idea. Do you have any other suggestions for honoring special people on your wedding day? Please share them in the comment section. Should I Use Ribbons to Decorate the Corners of the Battenburg Lace Huppah? Q: Do people use ribbons on the corners of the Battenburg Lace Huppah? Is there an easy way to attach ribbons? How many ribbons work best at each corner? A: People don’t usually use ribbons with this huppah, but you certainly could. Ribbons tie easily to the screw eyes at the tops of the poles that the canopy corners are tied to. It’s tricky to advise you on how many ribbons to use, since I have seen brides decorate our huppahs in ways that haven’t occurred to me and look great. I would say, though, for the Battenburg Lace Huppah I would keep the effect subtle. The line of lace that goes across each overhang is a notable horizontal visual element, so I wouldn’t add ribbons that make a strong vertical statement that competes with the lace. I wouldn’t use a mix of strong colors. The number of ribbons would depend on the width; I wouldn’t use more than two 1″ wide ribbons, though you could mix narrower widths. If you’re going to use ribbon, it works best if each ribbon is about 6-feet long and tied to the screw eyes at about the middle of the ribbon, so two 3-foot long ends hang down from each ribbon. If you vary the lengths of the two ends by an inch or so, the ribbons will have more movement, especially if they catch a breeze. Now Trending for 2012 Weddings: Organza Dresses, Accessories, Decor…and Huppahs! 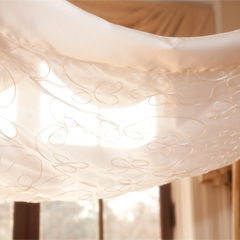 It’s only March, but I’m calling Huppah.com’s top huppah of 2012: the Organza Huppah. Organza always places among the top wedding fabrics, but this year it’s pulling away from the rest of the pack early. Organza’s light weave lets light diffuse through, creating a soft, romantic aura. The fabric has more drape than tulle and more body than chiffon, making it a great choice for dress overlays, fabric flowers and huppah canopies. Huppahs.com’s Organza Huppah features a thin ribbon scrolling across the fabric, to add texture and play gently with the light that filters down to the ceremony below. “Acacia”, vintage-inspired tea length bridal gown from Ellana Couture. “Floressa” organza flower bridal hairpin by PowderBlueBijoux. Silver organza favor pouches with navy and white scalloped circle thank you tags by WeddingsBySusan. Pale pink satin, organza flower girl dress with cascading vertical ruffles. For babies, toddlers, and girls, from Daisies + Damsels. Organza chair sashes, custom made in a rainbow of colors by GiftsForHer26. Whimsical organza bridal headband with rhinestone accents by TKDesignsetc. “The Lucille”, Ivory organza bridal or bridesmaid satin sash or belt by Ted Zeppelynn’s Fine Wedding Accessories. Huppahs.com has been honored with the title of Preferred Vendor at MyPartyPlanner.com. Thanks so much to everyone who nominated us. We really do love working with brides and grooms, their families and their wedding coordinators to make sure your huppah is a source of joy. And we appreciate everyone for taking the time to give us such great feedback. This is another huppah decorating option that works especially well for outdoor weddings. 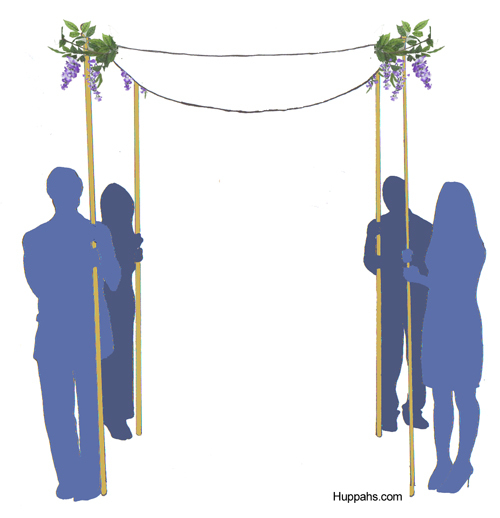 If you are using a huppah or poles from Huppahs.com, attach the garland to the screw at the top of the pole with florist wire. Anchor it to the bottom of the pole with florist tape. To create a balanced look, always start at the top of the poles and wind the greenery or flowers around all of the poles the same number of times. Consider carefully the direction in which you wrap the garland or the overall effect could end up looking unbalanced and a bit wonky. The easiest approach is to wrap all the pieces of garland in the same direction — clockwise or counter-clockwise — around the poles. Alternatively, as in the illustration above, start at the top of the poles and wrap the garland on the two left poles in a clockwise direction, and wrap the garland on the right poles counter-clockwise. In this way, the viewer’s eyes are drawn up and away from the center of the huppah space, creating a light and open feeling under the huppah. If your wedding ceremony is outside, scattering flower petals on the ground under the huppah evokes a sense of natural beauty that is easy and inexpensive to achieve. If you are getting married outside in the spring, you might be lucky enough to have nature spread a carpet of blossoms across your wedding space. If not, spread your own petals on the ground in the huppah space and maybe even in the aisle leading to the huppah. You can scatter the petals before the ceremony or incorporate it into the procession. Scattering flower petals is a great role to give one or two young bridesmaids or flower girls. Natalie and Richard show how they used this technique, along with ribbons and tassels, for their real-life wedding. You can evoke a world of different wedding styles depending on the types of flowers and other elements in the bouquets: romantic roses, shabby chic lavender, rustic sunflowers, wheat stalks tied with gingham ribbon, simple white hypericum berries, or bright pink and orange gerberas for full-on fun. To make this work, your poles will have to have a good anchor to attach the bouquet; either an indentation at the top of the pole to which you can tightly tie ribbons or florist wire, or an anchor attached to the pole. Huppahs.com’s poles, both huppah poles for sale and huppah poles for rent, have finials with indentations at the top that are often used to attach bouquets. The poles also have circular screws at the top that are used for attaching the canopy that can also be used to attach bouquets or other decorations. 1. Does Huppahs.com rent only hand-held huppahs? Yes, all of our huppahs are hand-held. This most traditional style of huppah is easy to put up and take down, and easy to transport to where ever you need it. 2. What cities does Huppahs.com serve? We lease huppahs everywhere in the U.S. We ship by FedEx. 3. Do I ship the huppah back in the same box it came in? Yes. Repack the poles and canopy in the box they arrived in, and apply the pre-paid return shipping label. 4. When I return the huppah, do I deliver it to a FedEx office, or will FedEx pick it up? You can do either – your choice. Drop it off at a FedEx location near you or call FedEx at 1.800.463.3339 to arrange a pickup. 5. When should I order my huppah? At least 3 weeks before the wedding to take advantage of $55 shipping (which includes a pre-paid return shipping label). For the best selection, reserve your huppah 3-4 months before the ceremony. We can get a huppah to you with less than 3 weeks notice, but the shipping cost will be higher. We’re a great last-minute huppah solution. Check availability online or by phone at 301-300.0950. 6. 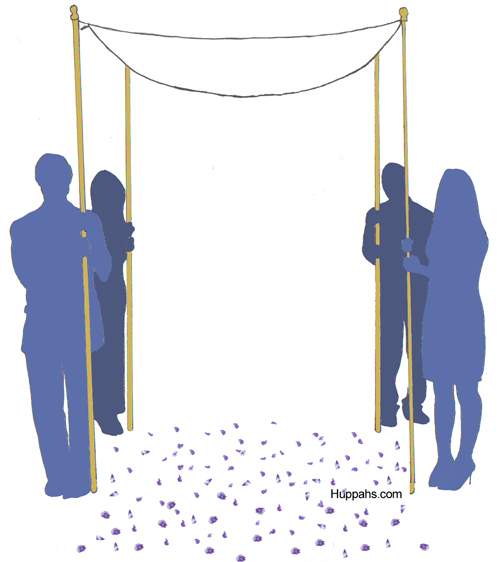 What’s the best way to incorporate a hand-held huppah into the procession? Most often, the huppah bearers lead the procession. The huppah bearers can also enter from the side of the ceremony space just before the procession begins. The arrival of the huppah is a breath-taking moment that focuses everyone’s attention on the ceremony…and your imminent arrival!